I thought that in addition to posting my own costumes here, this might be a good place to post pics of some of my collection of vintage jewelry, vintage costumes/clothes, and maybe the few pieces from movies. Anyway, the pin is so lovely and I feel lucky to have it! 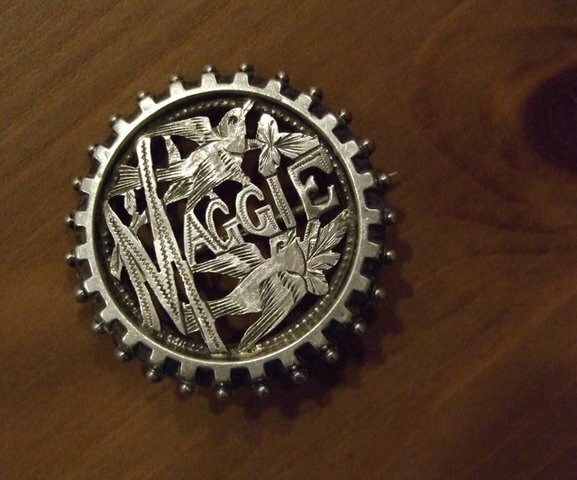 Such is the beauty of Victorian piercework, as in this lovely antique sterling silver name brooch for "Maggie", circa 1880's-1890's. The intricately crafted vintage pin is comprised of unmarked sterling silver (tested), with pierced openwork design of the name "Maggie" surrounded by two little birds and flower, with decoratively etched and engraved details. The romantic remembrance piece measures 1&1/2 inches round, has a decoratively notched and beaded frame with tube hinge and C - clasp or catch, and weighs 5.4 grams. A lovely example of sentimental Victoriana. It is mid to late Victorian, circa 1880's-90's, when name pins as well as place names (like those from the "Grand Tour") were very popular.